« Announcement for Vendors: Special Coverage of “Emergency Response Solutions”! The goal of the two companies is to provide a fully-integrated advanced distribution management system (ADMS) featuring Intergraph’s InService outage management system (OMS) including mobile workforce management and ETAP’s supervisory control and data acquisition (SCADA) system and distribution management system (DMS). A single user interface integrating these different applications will provide electric distribution operators with real-time situational intelligence for improved network reliability and resilience. The collaboration also includes the integration of ETAP’s engineering planning tools with Intergraph’s G/Technology® geographic information systems (GIS). The market is definitely changing and driving a new perspective on energy generation and production. In addition, retail markets and the need to support different behavior on the customer side, are contributing factors, where customers can be enabled to take advantage of different pricing structures of energy. 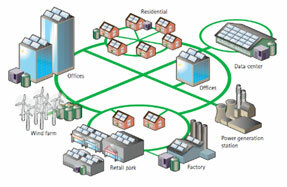 Gilles said that the whole concept of Smart Grid is bigger than the operations side. It also encompasses the back end asset management and the work management of the assets side of the grid. Intergraph has been looking addressing both sides of the utility dilemma, including the design and analytics of the grid before it’s put into place. Because of the new behavior of the grid, one has to consider optimal placement of capacitors, optimal placement of switches, doing relay coordinations, accounting for reverse negative flows in the grid, and the new tools in the GIS environment that are required to support these processes that the grid operator is facing in today’s world. Some of these tools are needed also when you are considering extension of the grid. New divisions in some of the suburbs or commercial centers, are presenting new behavior such as rooftop solar panels and wind farms. While the grid operator is actually doing asset management and work management, he has to start considering more design criteria and analysis for the new configuration of the grid to address all these new constraints. G-Technology is the GIS solution that Intergraph employs for this industry. The partnership with ETAP, a company specializing in network analysis, will provide tools that enable forecasts. For example, their tools will enable analysis of the distribution grids, provide tools for siting, cables, overhead lines, designing relay coordinations, settings of relays under the new operating commissions, analysis tools – analyzing the load of the distribution – distribution load flow tools, analysis tools for placing optimal capacitors to make the voltage profile in the distribution grid which is dramatically affected by the construction of solar energy or wind energy whether private or commercial or even by big providers. These capabilities will be added to G-Technology in the work asset management environment of the utility via the alliance with ETAP. On the operational side, there is the introduction of automation in the distributing grid and the need for the solution SCADA provider’s control and acquisition solutions. In addition the introduction of smart meters in the grid, make the distribution grid more observable where before it was totally unobservable. In order to address a lot of these properties of the grid, Intergraph has had solutions to combine distribution, SCADA, office management and distribution management systems. The distribution SCADA is required to support the information of the distribution network, the office management supporting the management of offices during natural events like snow and hurricanes. It also manages unplanned outages, and coordinates planned outages with customers when those condition have to be done for major repair or maintenance in the distribution grid. The alliance with ETAP will provide substantial added value to electric utility customers, primarily in the areas of integrated advanced distribution management including mobile workforce management, geospatial asset data management and integrated smart grid design and analysis, according to company materials. The alliance’s integrated solution also supports different operational configurations of Advanced DMS, some of which are market specific, and provides options to integrate parts of an end-to-end solution, depending upon customer need, such as the combination of outage and distribution management systems (OMS/DMS). In addition, the offering will provide flexible and evolving solutions enabling electric utility customers to integrate changes to grid operation and management with the increased deployment of intelligent devices, smart meters, distributed energy resources and microgrids. Indirectly, smartmeters provide a lot of advantages to the grid, and to outage management. Smartmeters inform outage management directly and indirectly of any disruption of services to customers. There is loss of services somewhere in the network, but also in specific locations. This enables the utility to respond faster and in less time than in previous times when customers had to call. Outage management is also coordinating the crews for the workforce out in the field, supporting the operations and maintenance of the grid, as crews are used to restore services. The Solutions Management System optimizes the normal operations of the grid when there is no problem. If you would like to optimize the operation of the grid, by balancing loads and feeders and take preventive actions against outages of the future, these tools are integrated. Some restoring services can be partially automated with the integration of mobile workforce management. To provide better services to customers, Intergraph’s InService is integrated with GIS capabilities, and provides complete geospatial visual interaction and complete dispatch of crews, all packaged into one solution. It will integrate Distribution SCADA and distribution management solutions with partner ETAP. The partnership will also bring integration. “There is still a gap between the model that work asset management is building with presenting the assets vs. the model of the electrical grid that is needed by the operational environment,” Gilles said. Intergraph is working with ETAP developing add-ons to that integration between work asset management modeling and the operational modeling of the grid, so the compatibility between the back end and the operationals can be guaranteed. The Smart Grid and utility world is still growing and has a way to go as solar and wind power become more a part of the distribution network. The volume of percentage of these distributed energy sources is growing and utilities have to respond quickly. Considering all the aspects of new energy sources, product and consumption and demand response programs, outage management, etc. there is a significant impact on the design phase of the utility now which is totally new for most utilities to consider. This entry was posted on Friday, February 27th, 2015 at 10:50 am. You can follow any responses to this entry through the RSS 2.0 feed. You can leave a response, or trackback from your own site.